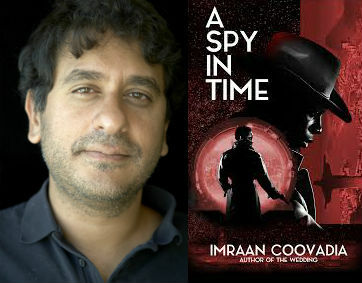 In A Spy in Time, South African writer Imraan Coovadia delves into the under-explored premise of “time traveling while Black.” A crime thriller with an Afrofuturist twist, the narrative zooms from 23rd-century Johannesburg to 1950s Marrakesh within the first ten pages. The inexperienced Enver Eleven, a junior case officer for a mysterious organization known only as the Agency, serves as the primary lens through which the reader acclimates to a seemingly utopian future where white supremacy has been eradicated. Yet even then, it remains a precarious status quo. As Enver’s mentor Shunami Six reminds him: “You must remember, Agent Eleven, that this world, our world with its philosophy of humanity, with its attempt to care about every man, woman, and child, every last black-skinner fellow—and even the tragic albinos amongst us—is a recent construction. It is not so long ago that simply being born in a skin like ours would have been considered a crime.” With his elegant prose, Coovadia folds in to the absorbing spy novel a nuanced interrogation concerning race, identity, and humanity. Mimi Wong: What was the initial inspiration for writing something like this? Imraan Coovadia: It was more of a solution to a whole bunch of stuff I’ve been thinking about. First of all, I admired my friends who write detective novels or thrillers or whatever it was because I thought there’s something really pure about writing a story simply for the desire to hold someone’s attention. I’d always wanted to do that as a writer, so I thought I’d better get around to doing it. So that was part of it. And the time travel—I guess, you know, all novels are kind of time travel novels—around memories and time periods. Time travel gives you a way to carry out that kind of movement. And then I was interested in the political questions our country is in turmoil around—race, colonialism, and what it meant to be black and white. But I also knew there was nothing new I could say about it in a direct way that would be useful. So I thought, sometimes you look at things through the angle of fiction, and it allows you a more interesting point of view. MW: I like this line near the beginning where you say, “The past is a foreign country and it is a country of the imagination.” I saw the use of time travel as a way to raise questions about what do we do with our history. In particular, what do we do with atrocities like slavery and genocide that have occurred in our past? How do we go about moving on from that? What was almost radical, sadly, was that the novel acknowledges that these things happen because so often in our national histories certain traumas get erased. IC: America is a stronger country than South Africa, and so it can have a much more optimistic version of the past. Whereas—I think it’s true of Africa as a whole—we have a huge number of catastrophes and disasters that make up our past, and make us who we are. In a way, there isn’t a very positive way that we can use the past without acknowledging that it’s full of all those kinds of terrors. And not just for some people but for almost everybody. And I think it means that time traveling while Black is a fundamentally different experience than if you were on Star Trek or whatever. The past is a really different place depending on who you are. Time travel writers, I’m not sure that they really exploited or looked into that problem as much as they could have. MW: I thought it was really interesting the way you approached writing about race in the novel. On the one hand, the narrative is very explicit about making clear that the protagonist is dark-skinned, that the people working in the Agency have black skin. You describe the “albinos” and the refugees, who are “pale-faced.” But then on the other hand, it’s also left kind of vague in terms of their origins or their more detailed ethnic make-up. I was wondering what your thinking was behind that. IC: Look, it’s partly that I’m South African. As a country, we have this obsession with skin. It’s not just color. Oddly enough, my mother was a dermatologist, still is actually. And so, she saw the day-to-day ways in which people had very complicated relationship to their own skin. It’s literally not just a black and white issue. It ranges across all kinds of behaviors and conducts. One example is a character in this novel uses skin-darkening cream. South Africa has this whole horrifying tradition of skin-lightening creams and people using them actually destroying their complexions because they left marks on them. Many people in the country made fortunes from selling these creams. When we talk about being comfortable in our skins or easy in our skins, it’s almost not a metaphor. It’s like a physical surface for the world. I wanted to turn that inside out. I wanted to imagine what it felt like to go from a place where the protagonist is quite comfortable. He’s young, but he’s quite comfortable in his own century and his own time. And he has to travel to these places where he’s clearly out of place, and he has to learn to be out of place. I thought it was an interesting problem for him to have. MW: At the same time, there’s something uncomfortable about this future, even though it seems to be this future that has done away with racism. You talk about characters who are nostalgic for the past. I’m curious what that was about. IC: Even when a majority group is happy, it’s always making life uncomfortable for some other group. I guess that’s just my theorem of politics. Even in the future that he lives in, where Africa is the center of things, there are people who are set on the margins. There are people who are treated in different ways. I think that’s just my experience of how people are. Also, when we all feel comfortable and we feel part of a majority, we feel like we have the right to behave in certain ways. We lose sight of what connects us to people who are powerless. For me, it was really interesting to explore that in the context of time travel and adventure. But it’s also an everyday thing for our country, probably to a certain extent for the United States, as well. You can’t always rely on people to be in the same place. Who has power changes over time. That in itself causes all of kinds of reactions in different ways. As a writer, it was quite a powerful tool to think about what emotions you have when you are placed under someone else’s authority, to recognize what it means when you own the future as opposed to the past, and all sorts of other similar paradoxes. MW: Right. And even separate from the issue of race, there’s the question of Enver as an individual and him trying to come to terms with the fact he belongs to the Agency. And that’s almost like a universal problem. IC: Absolutely. It’s a completely universal problem in all spy novels. Every kind of apprentice, every spy apprentice ends up getting betrayed in one way or another if you think about. In a sense, it’s like coming of age for spies. It turns out that all the authorities and institutions you trust turn out to betray you in one way or another. He definitely learns that part. He definitely learns to be an adult spy by the end of the book. MW: The novel jumps around to different places and times. But it begins in Johannesburg, and that remains the central location that the protagonist returns to. Obviously, South Africa is your home. But I was wondering from a narrative standpoint, what compelled you to set it there? IC: I live in Cape Town, which is the anomalous city in South Africa. It has the strangest demographics. It used to be the most liberal city and now it’s probably the most conservative one. It’s not a typical African city in any way. Whereas Johannesburg is the center of business and change, and it’s clearly an African city. If it’s going to interest you, it’ll interest you in that way. That’s what it has to offer. It has all kinds of migrants from different parts of Africa. It just has a kind of excitement and intensity that very few places on the continent have because it has so much economic activity. I was thinking of that idea of Joburg as the capital of the future in a way that New York has always been a capital of the future. I think Joburg has a smaller claim, but it has some claim to be that kind of city. MW: It makes a lot of sense in this world where Black people are no longer oppressed or enslaved. There are constant references to them being the sons and daughters of the continent. So it seems very fitting that in this world it would come back to Africa and not be set elsewhere, like in London or New York or another Western city. IC: That was definitely central to my thinking. There’s a lot of excitement about Africa, a lot of cultural excitement, obviously lots of interesting novels. Recently, lots of amazing science fiction novels have been set in Africa. And I think we have to get used to the idea that we’re not just defined in relationship to someone else, that we should have some kind of independence in who we are. That’s a very interesting place to be in as a writer. MW: In general, there’s a been a hunger for speculative fiction, and especially Afrofuturistic fiction, because it’s been a way to be able to imagine ourselves in a future and in contrast with the present, where we have been marginalized. What do you see as the potential for this genre? IC: I think like with most things, it’s one thing to think about it in an abstract way. I just read Tade Thompson’s book Rosewater. It’s this amazing science fiction novel set in Lagos. I think it’s the most exciting piece of African fiction I’ve read in years. Obviously, we had Black Pantherand all sorts of interesting pieces of writing. So almost independent of the need for it is all this really exciting fiction. I think one of the problems we have is that we still have very few readers—really, really few. I think in South Africa, we probably approach the same number of readers as writers. And it’s very hard to make your living as a writer. But the level of imaginativeness and creativity is amazing. It also means that you don’t have to replay the same kinds of themes about Africa that have been written about for the last 40 or 50 years. You also don’t have to write the novels of the European 1950s or 1920s in the African 21st century. I think Afrofuturism lets you short circuit a bunch of those fixed ways of thinking and to imagine something different. Africa is a very diverse, weird place. South Africa is a diverse, weird country. A city like Johannesburg or Cape Town, in five or ten minutes, you can go from one extremely strange experience to another that’s utterly different—a tiny different culture. So Afrofuturism lets you get a lot of the diversity of that experience. And I think that’s why it’s such an exciting genre to work with. MW: I read that the character of Shanumi Six was originally written as a man, and that on the suggestion of your publisher you rewrote the character as a woman. What was the reason for that change? And in general, how did gender come into play in developing the character? IC: [Robert Peterson of California Coldblood Books] is a very persuasive publisher and editor. I think what he reminded of is 19th-century adventure novels, and even up to the 20th century, they’re very male-centered. They’re not just sexist but they’re centered around men. It’s ridiculous because all women are kinds of femme fatales. Bob looked at the character who became Shanumi Six, who was a man, and he said, “You have an excess of men in this and you’re not making imaginative use of all the excitement you could have from having a woman who had that kind of strength and complexity.” I thought about it for a while, and I rewrote the character. I think she ended up much stronger as a result of having that kind of change. I think it made the mentor-protégé relationship that much more interesting because she’s a very strong woman who refuses to be a maternal woman. I think many women in leadership positions still have trouble because they’re being forced into roles they don’t want to be forced into. So I think it made her position more emotionally interesting that she had to be a woman to have that difficulty. I don’t think it’s good to write thrillers with exactly the same gender conventions as there used to be. At the same time, as a writer you’re never totally in control of what your character desires, or what he imagines—or she imagines—or fantasizes, or what they find fascinating. I certainly asked myself questions: what is his relationship to these people? How is it replaying any problematic views? And so forth. I’m not sure I entirely succeeded, but I was certainly thinking about them. Especially finding out how interesting it could be to alter those things and how it made the story seem fresher. 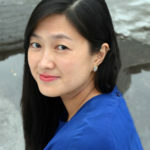 Mimi Wong is a writer covering art, culture, and literature. Her work has appeared in Electric Literature, Hyperallergic, and ArtAsiaPacific, where she is a New York desk editor. She also serves as the Executive Editor of The Offing.